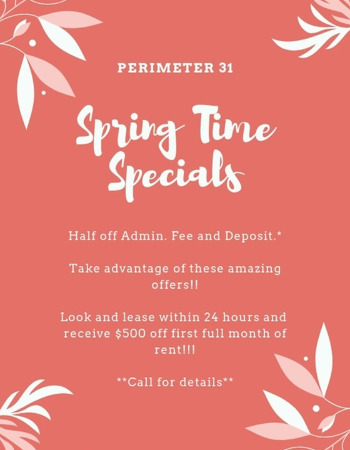 Perimeter 31 now offers newly-renovated apartment homes with granite countertops, stainless steel appliances, wood vinyl flooring and crown molding creating an upscale yet cozy atmosphere. Outside of the home, our residents enjoy all the shops and restaurants of Perimeter Mall and the surrounding Dunwoody community. Come experience the daily convenience of living near major shopping and dining establishments, I-285, GA 400, and the Dunwoody MARTA station. Give us a call today to schedule your personal tour.